Celtic face the Spanish big-hitters over two legs in the last 32 of the Europa League. Celtic's reward for progressing in the Europa League group is a last 32 tie against Valencia. The La Liga big-hitters are Glasgow-bound for Thursday's first leg, before the Hoops travel to Spain for the return fixture one week later. Valencia are a side with a rich history of success, although in recent years they have struggled to live up to their illustrious name. Marcelino has brought European football back to the Mestalla this season, though, with the club competing in the Champions League before dropping down to face the Scottish champions in the Europa League. Here we run the rule over what Brendan Rodgers' side can expect when they line up against Los Che. Valencia currently sit eighth in La Liga having endured a mediocre campaign to this point by their own standards. Los Che have been hamstrung by an inability to turn one point into three, with 13 draws across their 23 league outings ensuring they have fallen off the pace in the pursuit of Champions League football. Marcelino's side have still shown flashes of their underlying quality, however, in picking up some notable results. Earlier this month, Valencia held Barcelona to a 2-2 draw at the Nou Camp, with only a double from superstar Lionel Messi denying them all three points. Back in December they defeated Jose Mourinho's Man United 2-1 in Spain, having previously battled to a 0-0 draw at Old Trafford. A hectic schedule of late has seen their form take a dip, though, as injuries take their toll. Manager Marcelino says the players are "exhausted", with the club confirming a number of key players will miss the trip to Glasgow. Spain striker Rodrigo and talented left-back Jose Gaya have been left at home, while promising young forward Santi Mina will also miss the Celtic tie due to injury. Valencia have a selection headache in the centre of defence, too. Former Arsenal stopper Gabriel Paulista is currently sidelined and his replacement, Facundo Roncaglia, has since discovered he still has to serve a European ban from his time at Celta Vigo. Who should Celtic watch out for? While Valencia are missing some key performers, they still possess players with the quality to cause Brendan Rodgers' side real problems. Captain Dani Parejo pulls the strings in midfield. The former Real Madrid playmaker sets the tempo with his range of passing and is a set-piece specialist. Alongside Parejo, French international Geoffrey Kondogbia is a powerful midfield enforcer, who penned a permanent move to the Mestalla last summer after an impressive loan stint from Inter Milan. At the back, Agentina international Ezequiel Garay is a defensive mainstay who offers an experienced head for Marcelino's men. Out wide, on-loan PSG forward Goncalo Guedes and academy graduate Carlos Soler offer pace and trickery. Marcelino has been in charge of Valencia since 2017, during which time he's brought stability back to a club which at one point was threatened by relegation. 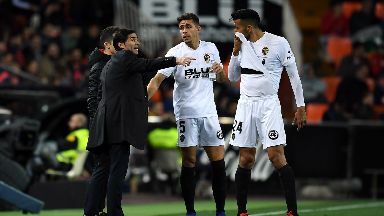 The 53-year-old took over at the Mestalla in May following a successful four-year spell in charge of local rivals Villarreal as Los Che sought a change of fortunes following a series of underwhelming campaigns. In his first full season Marcelino guided Los Che back into the Champions League. The Spaniard's success has been built around a compact defence and counter-attacking football. Valencia are a club with a rich history, although in recent years they have struggled to live up to their previous success. Often overshadowed by giants Barcelona and Real Madrid, Los Che managed to well and truly step out of their rivals' shadow at the turn of the century. Valencia reached first Champions League final in 2000 but suffered a 3-0 defeat to perennial winners Madrid. One year later they again went all the way to the final but again lost out, this time on penalties to Bayern Munich. The club still managed to make the period one of most successful, though, going on to exact a dose of revenge on Real by winning two league titles and the Copa del Rey. Los Che can boast European silverware in their trophy cabinet, winning the UEFA Cup and Super Cup during an illustrious spell between 1999 and 2004. Since then the club has struggled to replicate that form, with relegation becoming an all-too-realistic possibility a couple of years ago. Marcelino has helped steady the ship, though, and Valencia are back competing in Europe. Back in 2001, Celtic were dramatically denied a place in the fourth round of the UEFA Cup when they were eliminated by Valencia on penalties. Martin O'Neill's side dominated much of the game against a side who had reached the two previous Champions League finals, with Henrik Larsson pulling the Hoops level on aggregate before half-time. But the Spanish side eventually prevailed 5-4 on penalties, with Mista's spot-kick making the difference after Joos Valgaaren missed. Celtic also faced Valencia back the 1962/63 Fairs Cup. The Spaniards also came out on top on that occasion, winning 6-4 on aggregate.